In the Medieval Period this area lay within Strata Florida Abbey’s Mefenydd Grange. A water mill is recorded here (Williams 1990, 57). The place-name Swyddffynnon may indicate the residence of a grange official. 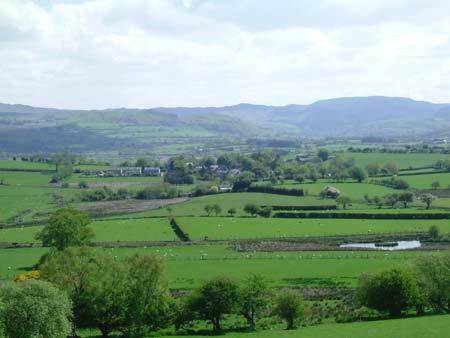 At the Dissolution all Strata Florida’s holdings were granted to the Earl of Essex. 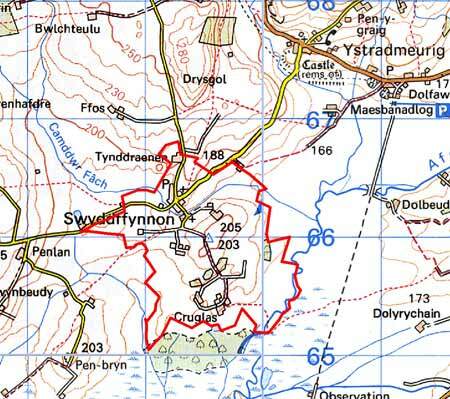 Soon after, the land around Swyddffynnon appears to have been purchased by the Lloyds of Ffosybleiddiaid and later acquired by the Vaughans of Crosswood. Historic maps including the tithe map of 1844 (Lledrod Tithe Map and Apportionment) and late 18th century estate maps (NLW Crosswood Vol 1, 62; NLW Crosswood Vol 2, 18) show the area very much as it is today - scattered farms and small enclosures - with no indication of the processes involved in its evolution, though it is likely that most of the farms date to the later Medieval Period, if not earlier. However, aerial photographs taken in 1999 for this project seem to indicate strip divisions in some fields, suggesting a former sub-divided or common field system. The origin of the hamlet of Swyddffynnon is uncertain although its population was sufficient in 1743 for a chapel to be built (Percival 1998, 523). This area consists of undulating ground ranging from 160m to 205m on the northeast side of Cors Caron centred on the hamlet of Swyddffynnon. Apart from this settlement, the landscape is one of scattered farms and small enclosures with small stands of deciduous woodland and coniferous plantation. Boundaries are of earth banks or stone and earth banks topped with hedges. Hedges are in fair to good condition; some have been replaced or are supported by wire fences. Improved pasture predominates, though some patches of rougher grazing are evident. Stone, which is cement rendered, left bare or painted, is the traditional building material, with slate for roofs. The loosely clustered settlement of Swyddffynnon is 19th century in character with a school, chapel and chapel house, and a few terraced, detached and semi-detached houses in the typical late 19th century regional Georgian vernacular style. There are also a few modern houses in the hamlet. The dispersed farms are relatively small, with farmhouses of two storeys in the typical Georgian vernacular style – gable end chimneys, central front door, and two windows either side of the door and one above. Strong vernacular traits such as low eaves, small windows and one chimney larger than the other are present on most houses, rather than more formal Georgian elements. Stone-built outbuildings are generally confined to one or two small ranges, with some attached and in-line to the house. Working farms have medium- to large-ranges of modern steel and concrete agricultural buildings. The recorded archaeology of this area consists mostly of post-Medieval sites. These are, however, varied and, as well as including domestic and ecclesiastic standing structures, comprise a mill, woollen factory, a gin, metal mine and smithy. Time depth to the landscape is provided by place-names indicating the site of a Medieval holy well and a Bronze Age round barrow. This area is very well defined to the south and east where it runs down to Cors Caron. To the north it fades into an area of larger enclosures. To the west lies enclosed land and rough grazing.